Adele is a lonely teenage girl looking for a chance to escape; to break free from the norm and enjoy her life. That chance is awarded to her when she is forced by her mum to look after her ageing Aunt, who also happens to suffer from severe agoraphobia. While initially this seems anything like an opportunity to change her life, that all changes when Adele takes a trip to the supermarket and notices Beth. She is the kind of girl that makes people sit up and take notice, she has that “thing” and Adele is drawn to it. Later on in the week, at a diner, Adele actually gets to meet Beth and the two start to strike up a friendship. Having someone new in her life and finally getting some attention, Adele finds herself cutting corners on caring for her aunt, in an attempt to spend time with her friend. At first they are minor things, but they steadily increase to the point where it may have deadly consequences for them all. 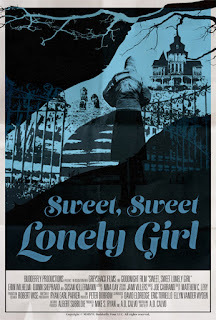 I have mentioned before that being a fan of horror films, it comes with the caveat that you inevitably have to see a lot of crap before finding that gem that comes out of nowhere; that diamond in the rough and “Sweet, Sweet Lonely Girl” is certainly one of those hidden gems. Whilst the above synopsis probably sounds nothing like a horror film, it is actually a fantastic Gothic horror that has been shot and designed to fit perfectly alongside the Gothic chillers of the 1970's. Funnily enough, over the past few months I had seen the poster for this film on the internet a few times and was immediately drawn to it. The throwback style of it made me think of “The Little Girl Who Lived Down the Lane”, however I just assumed that it would be the usual case of nice poster, crap film and didn't bother tracking it down for a viewing. However the other night I skimmed a review of the film where it mentioned that the film's style was reminiscent of the films by Osgood Perkins. Being the huge fan of “February” that I am (not to mention his following film “I Am The Pretty Thing That Lives In The House”), that was all it took for me to stop reading and to finally watch “Sweet, Sweet Lonely Girl”, and boy am I glad I did because I loved this film. While I can understand the reference to Osgood Perkins, I believe that the film that director A. D. Calvo has created here, can proudly stand on its own. It is a slow burning chiller, that when you think about it later, has a lot more going on then what you may initially think. This is is film that is focused more on character, as opposed to plot, and looks at how when a new friend enters your life, how much it disrupts your world that came before it. Although Adele is not thrilled about living in an old house with an aunt she never sees, yet has to look after constantly, she still goes about the job with considerable care. She takes her time to make sure the right food is prepared and the medicine needed is given at the correct times. She cleans, and does the daily chores for her aunt. However once Adele meets Beth, and Beth takes an interest in her, Adele will do anything to spend time with her and have fun, that something has to give and unfortunately it is her aunt that suffers. While there is never any menace in her neglect, nor are the things she does very big (for instance, the first thing she does is borrow money with the intent of paying it back), sadly once she starts breaking the rules, she finds it less hard to continue breaking them. It becomes more and more easier each time, until she goes too far and ends up suffering the consequences for it all. Adele is beautifully played by Erin Wilhelmi who gives the character the right amount of naivety, and although we can feel her loneliness, thankfully she never comes across as desperate or demanding of attention. When she meets Beth, Wilhelmi is able to evolve her character and give her a different aura as Adele is suddenly energised by her new outgoing friend. Finally, towards the end of the film, Adele goes through some mental trauma that Wilhelmi is very adept at performing. 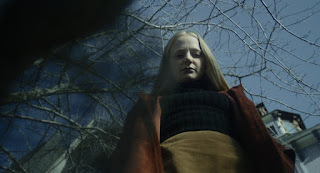 It is a very well rounded performance, and from a visual standpoint, as soon as she hit the screen I thought of Sissy Spacek from “3 Women” which may not be a coincidence as the two films share a similar atmosphere. The other main character, Beth, is played by Quinn Shepherd and to be honest, I wasn't as enamoured by her performance here. The film is set in the late 70's and for mine, she just came across far too modern and didn't seem to fit as well in this world. I will mention that there is a late reveal that explains a reason for this, but for mine, it still felt a little off. It is a complex role because she has to be bubbly and fun enough that you buy that Adele would be instantly attracted to her, but at the same time she has to come across as a little bit sinister, conniving and manipulative, and it all has to be done in a subtle fashion. Ok, lets talk about the really fun stuff now. To make a really great Gothic horror film you need two key ingredients. The first being an amazing house, and the second being some form of mental breakdown and “Sweet, Sweet Lonely Girl” has it all. The house is absolutely perfect. It is creepy as all heck with its old furnishings and little trinkets, not to mention that it has both a spooky attic and basement. The production design team deserve a big pat on the back here because what they have done here is nothing short of exemplary. One thing I love is when a house feels lived in, when it has textures and this has been perfectly realised here. The long corridors, the staircase, and most of all, the mirrors......just brilliant. Mentioning the mirrors is a perfect way to segue into my discussion on the visual style of the film. A. D. Calvo and his cinematographer Ryan Parker have done a brilliant job of aping the style of those 70's Gothic chillers past. This is a seriously good looking film, and disguises the low budget I assume it had. What I love most is that while the style looks similar to those past films, it isn't jumping up and down to be noticed as a throwback. This is a style that just happens to suit this film perfectly. I mentioned the mirrors above and that is because a huge number of shots in the film are shot through mirrors, sometimes multiple mirrors, and reflections. I am a massive fan of mirror shots and they are just done so well here, and I particularly love shots where mirrors break up an image to create another more interesting image, which is done here a lot. While I am not sure that an old lady would really have this many mirrors in her house, from a visual standpoint it is pure bliss. In fact all the scenes that take place in the house drip atmosphere, full of suspense and doom which is pretty good considering nothing really scary takes place until late in the film, but the set up to it is exquisite. There are also a number of surreal images where both Adele's and her aunt's visage intersect or are superimposed on top of each other, reminiscent of similar moments in Ingmar Bergman's “Persona” or the aforementioned “3 Women” by Robert Altman. Another huge factor in creating the mood or atmosphere is both the sound design and score. They appear to have been worked on in much greater detail than the norm for a low budget film, but this pays off superbly. The aunts ringing bell, the click of her light, the creak of her floor, the squeak of her rocking chair, the howling wind blowing outside, the pouring rain, not to mention the strange voices Adele hears from time to time; these all add up to create a spooky atmosphere whilst building suspense of what's to come. In regards to the score, the music is the kind of music that you would hear coming out of a child's music box. It is interesting that these innocent and playful sounds, actually have the reverse effect when added to the visuals of this film as they signal the omnipresence of a future doom. So was there anything about “Sweet, Sweet Lonely Girl” that I didn't like. Truthfully, not really. There is a moment in the film when Adele leaves the house to spend time at a lake house with Beth, and while I would not say that I disliked these scenes, I will admit that by being away from the house, the atmosphere of the film is lost briefly and it is my least favourite scene of the film. Interestingly this scene happens to be one of the most important, as it sets up everything for the finale, but I just do not think it is as impressive as the scenes that take place in the mansion. Overall, I really loved “Sweet, Sweet Lonely Girl”. It is always a joy to find a little horror film like this that just speaks to you. You will notice that in this review that I make no mention of the horror scenes nor the ending, but let me just say that they are definitely worth it and are very creepy. The ending is quite elliptical and my leave some people scratching their heads, but after thinking about it a bit, it becomes more obvious and as I said at the start, you realise the film has more going on with it, than you may initially have believed. I will make mention that paying attention to the brief dialogue from Adele's diary at the start of the film, helps understand it all immensely. The film is very slow paced, and not a lot of “action” happens until the end, so some people may be put off by it but it is also very short (without credits, it only runs 70 minutes) so I would definitely say that it is worth giving it a shot. 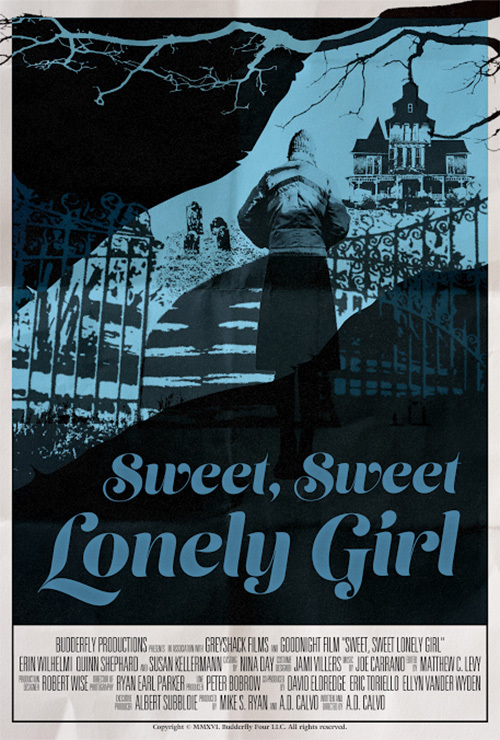 Personally I adored “Sweet, Sweet Lonely Girl”, and it has not left my mind since watching it and I can't wait to revisit it soon. 2015 was a big year for director Sion Sono. By far his busiest year of his career so far, the man shot a total of six (that's right, six!) feature films before the year's end. 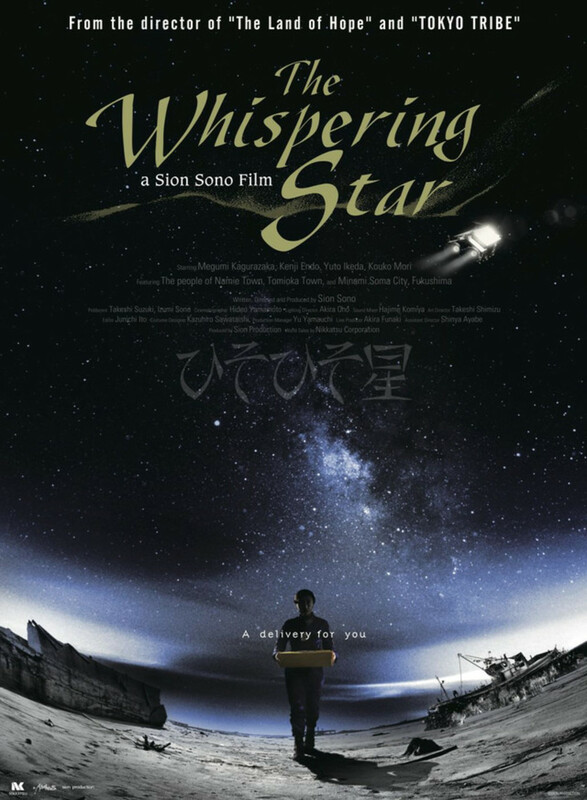 While most of these films were geared towards the mainstream, such as his gangster epic “Shinjuku Swan” and his teenage psychic comedy “The Virgin Psychics”, Sono also found the time to make a low budget sci-fi film entitled “The Whispering Star”. A passion project that he wrote almost twenty years prior, Sono finally decided that now was the time to shoot this film as he would be able to utilise the “no-go” zones of Fukushima (the town destroyed during the March 11, 2011 tsunami), to double as the desolate landscapes of an apocalyptic world where humans are on the brink of extinction. The story is as low key as you are going to find in a Sion Sono film as it is set in the future where, due to our own faults and carelessness, humans are almost extinct. What is left of the human race is spread out across the galaxy on numerous planets, essentially just living day by day until they finally die. Whilst the invention of immediate teleportation delivery does exist in this reality, and is readily used by most, there are still a few humans that prefer to have their packages hand delivered. To provide this service, female androids are sent across the galaxy in spaceships with the purpose to deliver these packages. The film follows one such android, named Yoko Suzuki (actually all the delivery androids are named this. Our one is number 722), as she is ten years into her delivery run through space, with about eighty odd packages still to deliver. Days, months or even years can pass between deliveries and to pass the time, we witness Yoko doing menial tasks such as cleaning, listening to her past recordings or just the simple process of making a cup of tea. She is all alone with the exception of her computerised pilot flying the ship, that looks like a 1940's tube radio, who may also be on the fritz due to the boredom of their long journey together. After a (long) while, Yoko starts to become curious of the packages that she is delivering and through examining what's inside them and contemplating why they mean so much to the recipients, she starts to become aware of just what it means to be human. This really is an atypical film from Sion Sono, as it is such a quiet little drama, to the point that you could almost argue that nothing happens throughout the whole film. While this is not actually true, the drama of the film is so minimalist, and the pace so slow, that I can not see “The Whispering Star” ever finding a large audience. Do not get me wrong, this is not a bad film, it is just an incredibly minor one. In fact there is a lot of good within it, not least of all its stunning black and white photography from cinematographer Hideo Yamamoto. It is obvious that the film was shot on a very low budget but I think to combat that Sono and Yamamoto have decided to make the shots as beautiful and classical as possible. I also loved the “home-made” quality of the effects and the ship itself. The fact that the onboard computer is an old radio is brilliant and I got a kick out of seeing that Yoko was powered by AA batteries. Also the old style kitchen, taps and cupboards, not to mention that the ship looks like an old cottage with some engines attached to it; it gave the film its own little identity. Yoko Suzuki is played by the director's muse and wife, Megumi Kagurazaka, and does so in such a quiet and subtle manner. In fact to prove this is unlike any of the director's previous film, Kagurazaka actually underplays the role to nice effect. Her presence gives the film a calm atmosphere, which actually makes it easier to go with the film and its snails pace. I must admit though, I wasn't exactly sure what Sono was trying to say with this film. There were moments or ideas that I liked such as the fact that by having a teleportation device, it made the world feel flat. To me this is how I feel about the internet these days and how easily available things are to us, to the point it feels like you can touch it immediately. The waiting for something or the searching for something, the anticipation, is often more exciting than the receiving itself and this is being taken away from us more and more each day. I also liked the notion that the act of receiving a package is like conformation that there is someone out there thinking of that person, and it is this notion that I think attracts the android. Other than these points, I found little to invest in with this film. The film moves too slowly, with not enough “action” to sustain it's 100 minute running time. I didn't understand why everyone whispered in the film, and there where things that I just didn't think worked well at all. While I appreciated the fact that for the most part there was no score, there is a moment in the film when the images suddenly become colour and music just swells; it is obviously a big moment for Sono but I could find no point at all for it. It seemed so odd and just didn't work. Also while using the devastation of Fukushima as a post-apocalyptic landscape may have sounded like a good idea, to me, I always felt like I was in Japan, not some strange part of the galaxy. Constant Japanese signs and a window advertising Visa just ruined the illusion for me. The biggest thing that didn't work for me though was the use of time in the film. There are constant title cards interrupting the images with the days of the week on them. 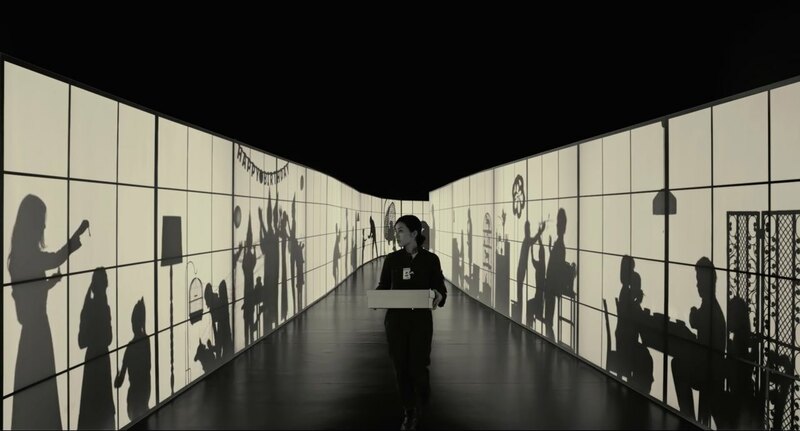 I guess this is to symbolise that time moves differently in space, but when a week goes past while Yoko makes herself tea, it then feels odd when we go through a whole large scene with her and we find out only a day has past. Then out of the blue, a title card will come up stating “One Year Later”........I found it frustrating and thought it added little to the film and would have been better off not in the film. While I certainly respect that Sion Sono made this little film, especially at the height of his popularity, and there are elements of it that I liked, I wouldn't say that this was a film I enjoyed. That said, I am glad that I saw “The Whispering Star”, and a different side to Sono's work. Restraint is the name of the game here, but I'm just not sure those who enjoy the excesses of Sono's usual style will find much to like here, in fact I think that it may struggle to find an audience at all.